A fellow Kentucky girl, Laura Kirkpatrick was a finalist on Cycle 13 of America's Next Top Model and has been modeling professionally all over the world ever since. But Laura is much more than a pretty face. 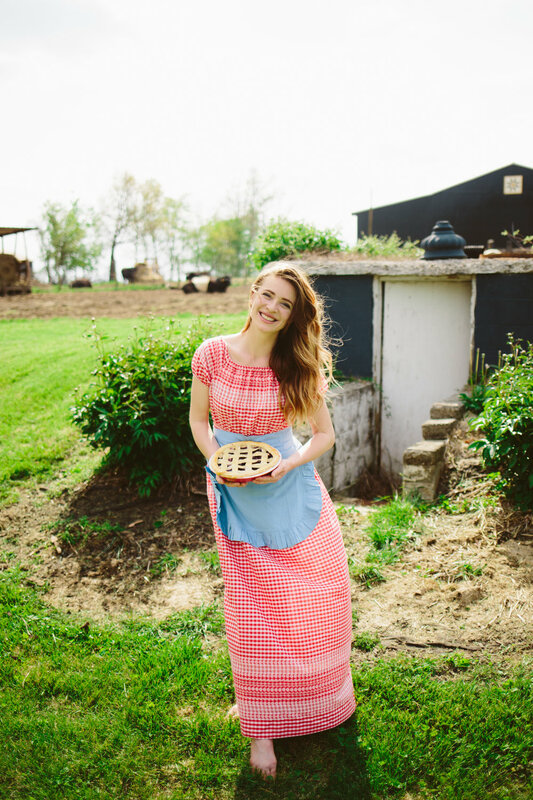 Always staying true to herself and where she comes from, Laura has also launched a successful business right here in the bluegrass! As a local Kentucky business ourselves, we always love learning about and supporting fellow Kentucky businesses. We were so excited to have this opportunity to visit Laura's farm and collaborate together. We hope you enjoy seeing Laura model our favorite summer dresses in her element as much as we enjoyed capturing them! Keep reading to learn more about what inspires Laura and her advice for fellow Kentucky girls! "The older I get I feel it's harder to be inspired, but man when something does it burns deeper than before." We've talked America's Next Top Model, life and the farm and more, but we've always wondered what inspires Laura! "The older I get I feel it's harder to be inspired, but man when something does it burns deeper than before. I usually find myself being inspired by soft lighting and texture. I like the small details, yet love when it’s minimalist. Growing up modeling I didn’t have the social media overload of inspiration like Pinterest and Instagram. A walk through nature usually will get me jazzed up!" Laura is wearing our 50s Orange Patterned Dress. This dress is available in store for $30. It might seem like Laura has accomplished enough for one person's lifetime, but she still has big dreams for her future. "Oh man, do we have enough time to talk about this?! I have a lot of dreams! Wes Jackson said “If your life's work can be accomplished in your lifetime, you're not thinking big enough.” I so often feel I can’t accomplish it in my life time but hope to inspire our youth so that they can run with it and make it what they may." Laura is wearing our Vintage Red Gingham Maxi with Elastic Waist. This dress is available in our online shop for $48. "I want to prove you can be a mom and accomplish your dreams!" Laura has dreams to bring more tourism opportunities to the bluegrass and expand her new business. "mMy future dreams are to do some Kentucky Ag Tourism, and for many reasons. I want to get people back in to exploring the outdoors, growing their own food and encouraging kids to farm, whether it’s a small herb garden or a huge ranch. I feel it would be so beneficial to our youth and our state. I want to draw tourism in to Kentucky, and I want to help Kentucky business and Kentucky farmers. Growing your own food is so freeing, and I want to get people back in to the basic lifestyle of all that. I feel it makes for a more balanced life. I also feel there’s this huge trend in farm to table, and people are wanting to know where their food comes from and how it’s made. I think that Kentucky can capitalize on that, and I have the platform to do so. Kentucky has so much potential, and I have a huge following from all around the world. I think I can help be the voice of the people that often get lost in the crowd. Hopefully soon you will see me teaming up with a lot of great Kentucky organizations to make this happen! I have also recently been making bigger goals for my modeling- going after bigger brands and dream jobs. I want to prove you can be a mom and accomplish your dreams! 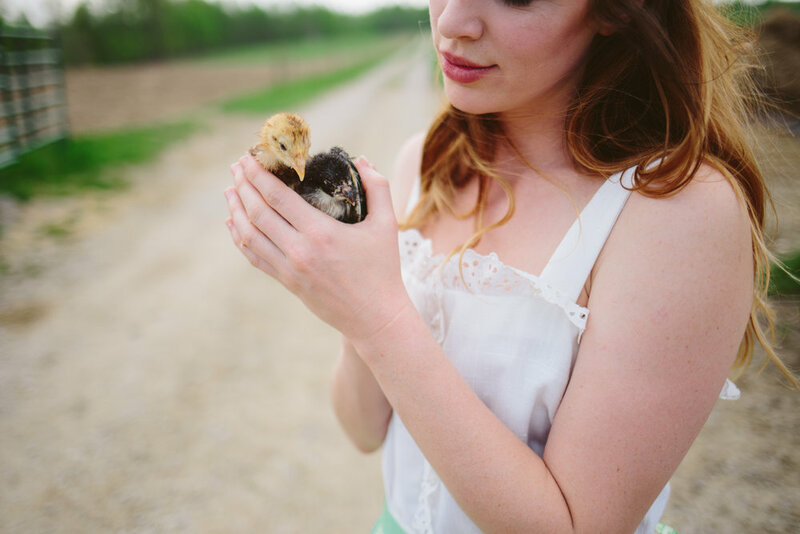 And for Kentucky Darling we hope to partner with a restaurants and some cool local foodies soon!" Laura is wearing our Vintage White Dress with Eyelet Panel. This dress is available in our online shop for $45. "You will never regret trying as hard as you did." As a small town Kentucky girl with dyslexia, Laura has paved the way for herself and defined who she is through her hard working and passionate nature. She inspires us. We just had to know what advice she would give fellow Kentucky girls. "If I can accomplish my dreams so can you. If you work hard enough and smart enough you can do it. But just know you will hit bumps in the road and it will be hard. There will be times you feel like you just aren't good enough to make it where you want, and that you should throw in the towel but if you keep working your hardest on the worst of days one day it will all pay off. You will never regret trying as hard as you did. There are people from all backgrounds that have had so little and have still come so far. Most of they time it's all cause they didn't give up. And ladies, don't let boys get in the way of your dreams. I don't care if "he's the one," I see so many girls get lazy with their dream because of a boy, and I have even done it to myself. That's something you will look back on and kick yourself for." Laura is wearing our Vintage Blue Flower Power Midi Dress. This dress is available in our online shop for $60. We hope you're enjoyed our collaboration with Laura Kirkpatrick! You can find Laura on Instagram @laura_allstar! You can also visit www.laurakirkpatrick.com to learn more about her and www.kydarlingmeats.com to learn more about her new business!